Custom Bingo Daubers: Custom Printed Bingo Daubers/Markers for Bingo Halls, Casinos, Clubs, Special Events, and More! 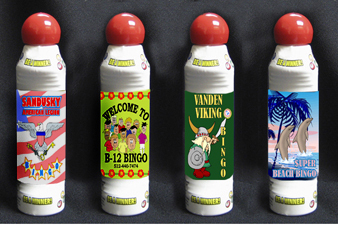 You can have 3 Ounce Custom Bingo Daubers with your full color design on each Dauber! Our Custom Printed Bingo Daubers feature the same, high quality ink that you’ll find at the country’s largest Bingo Halls. The minimum order is just 10 gross (144 pieces per gross) or 1440 total Customized Bingo Daubers. And, you can get as few as one gross of each color, so mixing and matching of colors is okay. The following 8 Bingo Dauber colors are available: aqua, blue, green, orange, magenta, pink, purple, and red. Standard production time for Custom Bingo Markers is 7-10 business days after proof approval. For additional information on our Custom Bingo Daubers/Markers, please contact us at 1-800-233-0828. You might also be interested in our Bingo Systems, Bingo Paper, and other Bingo Supplies.